If you are a fan of trying out DIYs and crazy artistic experiments then, you probably have heard of Silhouette Portrait Review. This is a brand dedicated to making cutting machines and their accessories so as to ease the process of crafting. The Portrait is one of their most popular cutting machines mostly because of its affordability and lightweight. This is a new product that has managed to incorporate new technology such as PixScan and Bluetooth into art and craft. Just like a printer, the Portrait outputs designs made on software on your device by actualizing them on real material. This is huge plus sure to transform your crafting life. Is it really the Portrait a good choice for you? The below content seeks to help you answer this and many more questions that you may have regarding the Silhouette Portrait Review. 1.3 What Materials does it Work With? 1.4 What is its cutting size? The Silhouette Portrait is a versatile cutting tool that has garnered popularity ever since it hit the market in 2012. It works to serve the same purpose as the Cameo but in a lighter and smaller package. This crafting tool is easy to use and that is probably why it is particularly popular with beginners. Plus, it works on a wide range of materials including those as hard as the rhinestone template. You will, however, have to download Silhouette Studio on your device before you can start designing. This is the platform required to draw out the designs before cutting. The software is available both on PC and Mac. You do not necessarily require any special skill set to connect your device to the Silhouette Portrait. The connection is wireless and works through a simple Bluetooth connection. In case your PC doesn’t allow for Bluetooth connections you can use a USB connection. Its, however, is limited to small crafting projects like making cards and stickers. This is because of its small size. The good thing is that it makes relatively accurate cuts and therefore actualizes your designs as intended. You can purchase the machine separately but I’d advise you to consider the bundle deals. This is only because you will end up gaining more for a lot less than you would if you had purchased each item separately. The bundle also ensures that you have no trouble finding the right accessories for your machine. 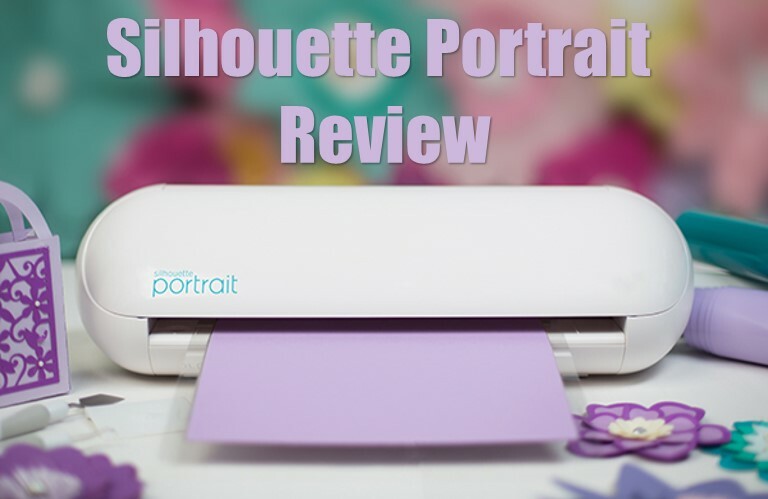 If you are looking to purchase the Silhouette Portrait, you should first go through our review. It is an honest and genuine review of the product that aims to guide you towards making the right decision. The Silhouette portrait machine comes with accessories that are important for it to work efficiently. The full package consists of a Silhouette Portrait cutting machine, power cable, USB cable, cutting mat, adjustable blade, an introductory guide, Silhouette Studio Software and a download card for exclusive digital cutting designs. Some of this accessories are however not permanent as they are prone to wear and tear. The auto-blade may break or become blunt when cutting tough materials and it will require you to replace it. The cutting mat also needs replacement after a few months of use. What Materials does it Work With? Small as the Silhouette Portrait is, it is capable of cutting through over 100 materials. This includes fabric, heat transfer material, cardstock, vinyl, chipboard, paper, and even rhinestone template material. This versatility makes it a great to tool to experiment with different materials. This is all possible because it is equipped with an auto-blade that works with a moderate cutting force allowing it to reliably and accurately cut through these materials. You should, however, avoid placing tough objects as they may only reduce the machines efficiency rather than cutting. What is its cutting size? The Silhouette Portrait has a smaller cutting size in comparison to the Silhouette Cameo. This is probably its only limitation against the Cameo. The Portrait is therefore only ideal for simple and small crafts and designs. When equipped with a cutting mat, it can make cuts on materials with dimensions around 20cm by 26cm. There is, however, no need to worry as all materials that come in the package are compatible with the Portrait. The Silhouette Studio Software is part of the wholesome package. It is the platform used for sketching and drawing the designs before they can be cut by the Portrait. You simply have to install it before you can use it. The instruction guide gives a step by step procedure on how to work with the Silhouette studio. The software is generally easy to work with and it gets easier to use with time. You can even draw out designs without going through the guide first. The Silhouette Portrait just like all products promises to offer a tonne of features. But are this features really worth investing in? I went ahead and listed the pros and cons of the Portrait so you could easily make the choice for yourself. The Portrait is relatively small in size and light in weight, therefore, increasing its portability. Its small size consequently means that it does not occupy a lot of space. The Portrait can cut through a long list of materials making it a diverse and versatile cutting tool. Its reading and cutting accuracy is remarkable as it makes perfectly smooth cuts and creates beautiful designs. The Portrait beats the Cameo when it comes to favorable pricing. The Portrait costs a lot less than the Cameo for similar features. Easy set-up and startup. The Silhouette Studio installation procedure is very easy to follow. The connection between your device and the cutting machine can be done wirelessly via Bluetooth or through a USB cable. Plus, initial start-up takes an average of about seven minutes which is impressive in comparison to other brands out there. The Silhouette Portrait is compatible with popular device operating systems. It can work on either PC or Mac. You can work on designs without necessarily having a network connection. The Silhouette Studio has an offline mode that allows you to work even in areas experiencing poor internet connections. It has PixScan technology which allows the Portrait to cut around a printed image. Now you can turn any image or a random sketch into a cut job. It is also very easy to learn how to work on with Silhouette Studio. The more you interact with the software, the more you learn. If you are having trouble, the guide can help you out. Some YouTube Channels offer really great tutorials that you should also check out. The Portrait can only cut small areas of sheeted material. This is unlike the Cameo which can cut relatively larger sheets. The Portrait’s alignment and calibration are not always perfect and this can lead to inconsistent cuts. The accuracy of the Portrait is not up to commercial standards. This makes it more of a hobbyist and experimental tool rather than for making commercial products. The attached cutting mat also brings problems during cutting. It sticks to some materials and this can even lead to shredding. The best way to avoid this is however by using a lint pillow. When comparing the Silhouette Portrait to the Cameo the most obvious difference is the size. The Portrait has a considerably smaller maximum cutting width as compared to the Cameo. Hence the Portrait can only cut small decals and cards whereas Cameo’s larger cutting width gives it more flexibility for certain kinds of signage. The inside of the Portrait is actually identical to the Cameo 2. It is however different from the Cameo 3 which is a newer model hence a more complex model. It is important to note that although the Silhouette Portrait is not as accurate and precise as the Cameo, it is still rated above average by most users. It is especially ideal for beginners and users who would rather work on small and simple designs due to its specialization in a smaller material. The Portrait uses the same design software as the Cameo which is the Silhouette Studio Software. However functionality in the Portrait it differs from the Cameo as certain features are not available for the Portrait. Additionally, the Cameo is able to operate even in situations where a computer is not available as it can read data directly from a USB drive, unlike the Portrait that works strictly in collaboration with a computer. The first question asked by many is whether the Silhouette Portrait is available at a pocket-friendly price. We found that it is indeed cheaper when compared to other vinyl cutters in the current market. The communities that deal in small crafts have certainly given it thumbs up as have buyers on Amazon. The feature that has received most praise from various reviews is its ‘startup and cut’ feature. Beginners and newbies in general, in the cutting world, have commented on how the Portrait can be set up from scratch and run within 10 minutes. On the negative side, quite a number of users have shown considerable concern over the reliability of the machine especially for the calibration feature that often raises concern. The Silhouette Portrait is a machine that is small in size and very compact meaning it will have no issues in fitting on a desk. It offers expert cutting technology at a cheap cost as compared to other machines built to work on thicker materials. Therefore, for those interested in working in small material such as stickers will find the Portrait as the perfect machine. For those new in the world of vinyl cutting machines, the Portrait is a great start to mastering the craft mainly due to its ability to operate on most decals and small crafts. It has been noticed that the Portrait is a very portable machine due to its lightweight. The Silhouette Portrait is a lot cheaper as compared to the Cameo 2, which has quite similar characteristics in terms of cutting technology. Admittedly, the newer Cameo 3 is more superior to both the Cameo 2 and the Portrait. The greatest difference between these cutters is mainly in size and to a lesser extent in precision. However, if one is intending on starting a signage business, it is notable that neither the Portrait nor the Cameo is unlikely to serve these goals effectively. Generally, if you are in purposing to work on projects with small cutting size, the Portrait is a cheap yet excellent vinyl cutter bound to please the user and at the same time gifting them great exposure and introduction to Silhouette Studio Software and its various capabilities. It has been found that the Portrait has similar cutting force as the Cameo hence it can easily cut through the following materials; tissue paper, paper or cardstock that is fairly thin in width, iron-on transfer, vinyl, rhinestone material, lightweight fabric, craft foam, and cereal box chipboard. Some of the materials that are rather heavy, such as balsa wood, cannot be cut by the Portrait even though it has a double cut feature. Even though the Silhouette Portrait can only cut through the relatively thin material, they have high-quality cuts that can even cut complex designs without much problem. However, an issue that has been brought up a lot by users is that the cutting mat can get too sticky, leading to difficulty in attempting to peel off the material being cut without it ripping apart. Also, if an individual receives any type of trouble when using the blade, it is possible to contact the Silhouette’s Customer Support who are ready to provide a new blade at no extra costs. One may experience teething problems in the Portrait when dealing with intricate details that have lots of minor details as the machine may even cut off-line. Luckily, this issue has already been resolved and if one notices this all you need to do is slow down the cutting speed using the software for better accuracy and more reliability. One can find deals with good bargains for the Silhouette Portrait on Amazon and also on the Silhouette America website. Amazon is the more reliable place as they hardly run out of stock and also offer cracking bargains that will surely save you a good deal of money. The Silhouette Portrait is a tool that will particularly suit art enthusiasts trying to venture into crafting designs. The machine is a great pick especially because it offers a versatility, efficiency and unique features all at an affordable price. It can cut through a wide range of materials, uses a wireless connection with your device and is lightweight. This makes it an ideal choice. Buying the Portrait is a choice you will not regret.